Updated: I added some months before December 2006, so you can see there the tendency: there is always a peak in December and that peak is always higher in Venezuela. As I have reported before, Carabobo is one of the most dangerous states in an already very dangerous country. 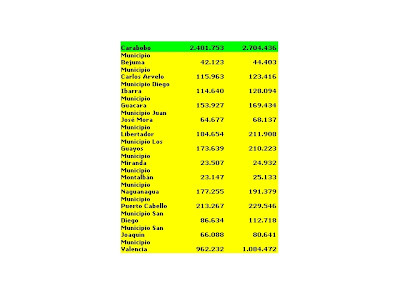 Here I present some statistics on murder per month since January 2007 showing the share for each municipio. Most murders in the municipality of Valencia take place in the South, where half a million people (half of its population) live. There is no general hospital there, only a big maternity centre. There are some small health centres, one tiny public library, bad electricity, worse sewage and a even worse garbage collection service there. Forget about the police going there. The municipalities Diego Ibarra and San Diego have about the same amount of inhabitants, but check out the amount of murders for each one: Diego Ibarra had 107 murders, San Diego 25 for 2008. There is a national police, a state police and a police for each municipality and they do not work together. Below you have the statistics on population per municipality for 2005 and 2010. Take the current figure to be closer to 2010 than to 2005. As I said earlier, there will be more than 220 murders for the state of Carabobo in December of 2008 if the state does not do anything effective.